Real Full Spectrum, Energy Saving, high PAR/PPFD LED Grow Lights, with a Close Match to the McCree curve and Natural Sunlight - Just what your plants need to thrive and increase yields. ELPL-PRO-LED-100W: PRO-LEDTM 100W - Grow-lights are Fixed spectrum LED lights, with a 90~95% match to the McCree Curve, and an 80+% match to Sunlight - the highest in the industry. 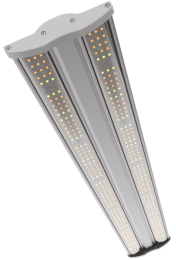 These unique and original lights feature MeanWell Drivers (RoHS/CE/UL Approved), have passive cooling, are water resistant (IP54), and come with your choice of high quality 60°, 90°, or 120° borasilicate glass lenses - 0~10V dimming is optionally available. 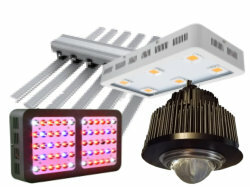 ELPL-ARANHATM Series: The ARANHA-670TM and ARANHA-1000TM LED grow-lights are fixed spectrum LED lights, with a layout similar to many popular grow-lights, but with improved performance. The ARANHATM series of LED Grow Lights, are ideal for all types of growing applications including vertical farming, hydroponics, aquaponics and shelf growing, where medium to high power, compact format, LED grow lights, with high PPFD are needed. 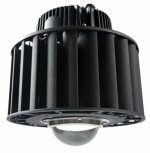 The ARANHATM series comes equipped with 0~10V dimming built in, and has RoHS/CE/ETL Approval. ELPL-GroFluxTM Series: The EconoLux GroFluxTM series are fixed spectrum lights that are ideal for all types of growing applications including hydroponics, aquaponics and soil growing, where medium to high power, top-light LED grow lights with a compact format, and high PPFD are needed. They are suitable for all types of plants including flowering plants. The GroFluxTM series of top lights comes equipped with 0~10V dimming built in, and has RoHS/CE/ETL Approval. ELPL-VertiFarmTM Series: The EconoLux VertiFarmTM series are fixed spectrum lights that are designed specifically for growing applications where vertical space is at a premium due to their low-profile - only 3.8cm (1.5") high! They are ideal for all types of growing application including germination, seedlings, hydroponics, aquaponics and soil growing. They are compact format, medium to low power LED grow lights, with high PAR/PPFD. They are suitable for all types of plants including flowering plants and have a built-in RoHS/CE/ETL approved universal (100~270VAC, 50/60Hz) power supply/driver. Home Growing LED Lights: EconoLux will be offering a line of budget home use LED grow-lights, with superior spectrum to what is generally available - Coming soon. COBs for growing plants: EconoLux Industries Ltd. is the exclusive manufacturer of the MC and VXS series of plant-light-on-chip-grow-light COBs. These COBs are scientifically designed to have a close match to the McCree Curve, and to natural sunlight. We also make custom COBs to suit your desired spectrum. Custom Grow-lights: EconoLux also offers a complete bespoke or semi-custom LED grow-light design and manufacturing service. We can build LED grow-lights to your specifications, under your brand name with confidential service.